A Matter of Memories: :SALE: 12% OFF on everything SPRING at Scrapbook.com...TODAY only! 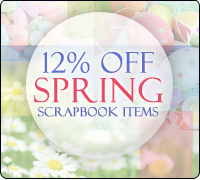 :SALE: 12% OFF on everything SPRING at Scrapbook.com...TODAY only! I don't know about you, but I sure am ready for spring! Take 12% off the lowest marked price on ALL Spring-themed products*, today only, at Scrapbook.com! *All products where theme includes "Spring" are eligible once they are added to your shopping cart.